So did I achieve my Write1Sub1, goal this month? I've also written a 500 word flash fiction feline tale for another competition, which I may expand and submit elsewhere, as I feel it might not be quite suitable for this particular venue and I plan to write another entry instead. It will happen It will take time. I'm getting there one step at a time. What can I say it was fabulous! Vanni (Myfanwy Cook) has a great presentation technique and researches her markets thoroughly. What essentially children's books must be about. Can you guess? Thanks again for all your well wishes. I've had good and bad days this week, but celebrated my birthday several times with different friends and family being treated to my favourite soya lattes at local Costa Coffees. It's my birthday week starting today, so I'm just posting to say I may be very quiet this week, but rest assured you are all on my mind and I will return to your blogs soon. Hmmm I guess I'm a mix of the two (above). 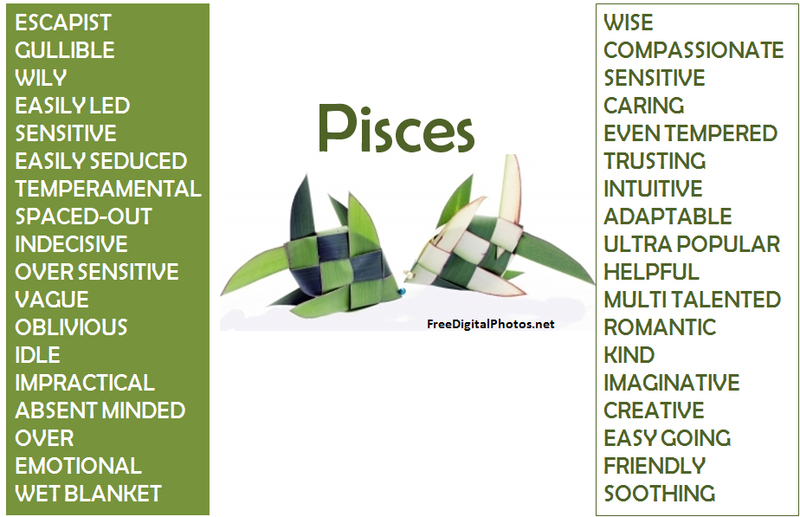 Do you use horoscopes to determine the traits of your characters? I do sometimes check them out for ideas. Thanks for all your well wishes, yes I'm feeling very tired still. How many of us complain we have nowhere to write? 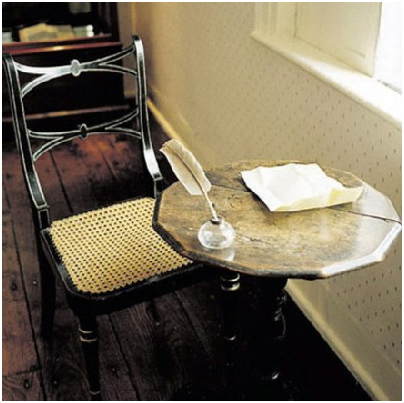 Just look at how small Jane Austen's desk was compared to so many well known authors. It made us gasp with mirth at the tiny space. My own desk is a mess of papers with hardly room to toss a thought about. Sometimes I like to write freehand in the conservatory in a notepad at others I'll scribble away happily while seated on a train. I guess it doesn't matter where we write but that we do! So what stops you from writing? What stops me is sharing a small office with hubby when he's playing youtube videos or scuffling about the filing cabinet like a giant gerbil. If I've been quiet it's because I've been poorly again over the past week or so. Last night I even dreamt I was tired... I'm trying to catch up again now. I also had computer network adapter problems. I think I've resolved it by downloading the latest drivers so that I don't get the no or limited connectivity anymore (fingers crossed) I'm also trying to find my hobby room under a pile of papers that need sorting and get back to my novel. How about you? 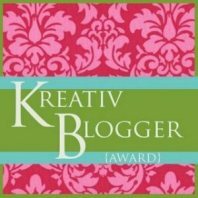 Huge thanks to Patsy for awarding me with this Kreativ Blogger Award. I am always delighted to receive such fabulous accolades from my blogging peers. Susan at I Think Therefore I Yam whose presentation and content of her blog osts is truly creative. So her followers would not get bored. 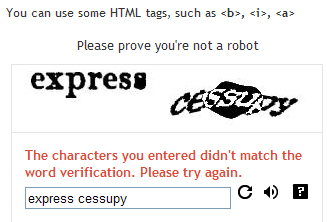 I use word verification on posts to weed out the weirdo spam comments. Some that get through can often be quite disturbing. While it is often humans who post the weird comments, word verification is supposed to show that the comment has been made by a human and not machine. "Captain it appears to me to be a simple configuration of shape, colour and letter form cleverly merged together to disguise each letter with visual texture and optical illusion. The difficulty as I see it, Captain, is that most human eyes are not sufficiently evolved to cope with the contrasting stimuli." I can read the first word, but those words in the blurry black and white smudge often confound me! I know many of you dislike word verification. What are your thoughts on the subject? In other news. I shall be doing a Review of Rachel Morgan's first Creepy Hollow installment Guardian on 8th March. This will be followed by an author interview a few days later, so do come along and join in the fun. Hosted by DLHammons. 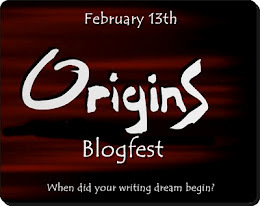 On Monday, February 13th, you should post your own origin story. Tell us where your writing dreams began. 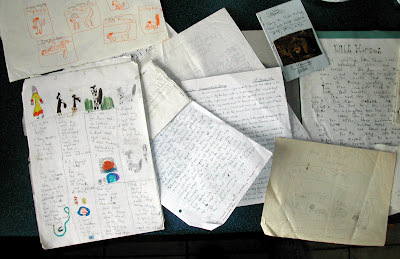 It could be anything from how you started making up stories as a child, or writing for the school newspaper, or even what prompted you to start a blog. How about the first time somebody took an interest in your writing, or the teacher/mentor that helped nudge you along and mold your passion, or maybe the singular moment when you first started calling yourself a writer? It all started somewhere and we want you to tell us your own, unique, beginnings. A LIBRARIAN MOTHER & A TEACHER/ VICAR FATHER. 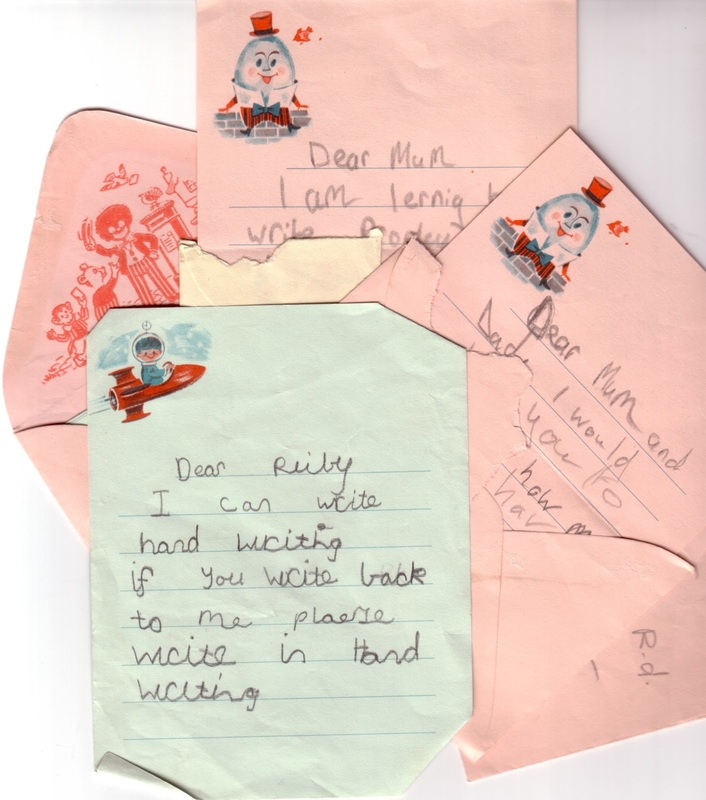 ...and I excelled at English Language at school, which was very encouraging. One of my stories was even read out as the best example by my teacher in 1979.
and with your help I just may even suceed. He could take down the numbers, again. The coldest weather of that winter began to set in as his wife, Marcy, packed her bags and left for her mother’s. Andrew wanted to be manly about it all, but his heart gave a little whimper as her car pulled out of the drive. He couldn’t say how long he had stood looking down the road, his eyes red with the afterimage of her brake lights. Eventually, he wandered into the kitchen, which normally greeted him with the smell of his wife’s freshly baked cakes, bread and all those bubbling pans of delicious food. Now it was quiet, clean and lifeless. He coughed as his heart squeezed with emotion. Answering the call of nature he hurried into the downstairs washroom. The smell of lemon scented toilet gel danced brightly around the room and he another pang of love for his wife swelled. He reached for the toilet tissue, realising that his hand was flipping an empty cardboard roll instead. He fumbled in the cupboard to find a fresh roll. Why had he never noticed all those little jobs that Marcy did without mentioning? He wandered into the living room. Their favourite programme was just about to start, but he couldn’t laugh at the comedy because his hollow heart still echoed from her departure. He missed her so much, already. When eventually he took himself up to bed Andrew stared at the vast, empty divan. In thirty years of marriage they had never slept apart. That night was the longest and coldest he could remember, without the warmth of his wife’s body beside him. In the early days of their marriage they had made love with a passion, but these days neither seemed in the mood. Two long weeks ensued before Marcy's mother recovered sufficiently from her fall so that Marcy was able to return home. As Marcy entered the house Andrew was there by her side with flowers and chocolates. “I’ve got something else for you” he said, taking her hand and leading her up stairs. He nibbled her neck at the top of the landing and slid a hand over her breast. She responded with her mouth hot and eager on his own. They fumbled with each others' clothes, pulling off jumpers and trousers with the eagerness of young lovers, as they stumbled and fell into bed. After a deliciously sweaty climax they lay in each others' arms beneath the duvet. Oh wow! 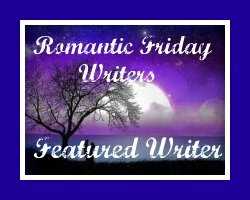 I am Featured Writer this week with Erin Thank you! My RFW post for The Long, Cool Aphrodisiac will be posted Saturday afternoon. Thanks to Cassie Mae and Angela Cothran for hosting this blogfest. I've had a fun time. The final prompt is for an Emotion Flash Fiction : Emotion is the engine of a story. 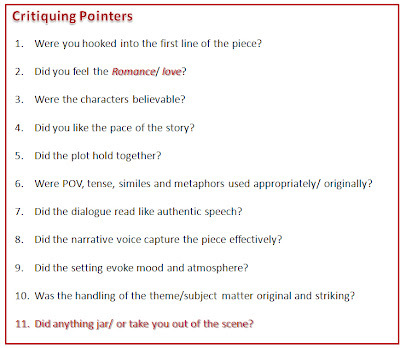 Pick an emotion and in a flash fiction piece of 250 words MAKE us feel it! We want to connect with your character. Ginny's head felt as fragile as a cracked eggshell, as she lay on the top of the handmade patchwork quilt that had been one of her sister-in-law’s creations, in blues with hints of gold. She could feel the tears on her cheeks like dried, stagnant pools, while a twisting burn gripped her throat. She hadn’t even had time to have her breakfast. The initial shock of waking that morning to find two police officers on her doorstep, with sombre expressions and restless, wary eyes suggested that the news must be unconscionably awful. Her voice strangled right out of her throat as they explained that a man fitting the description she had given them for Bernard, had been found stabbed the previous night. They would like her to accompany them to the mortuary to identify the body. A frenzy of the most intense emotions had begun circulating around her body. She felt her head lift as light as a helium balloon. The firm hands of PC White helped her to a chair. Questions had begun competing for answers in her head. Why was Bernard at that particular pub? Why hadn’t Guy been with him? Could it be someone else? Nothing since yesterday morning had made any sense. The twisting burn in her throat returned as the stark image of that grey, lifeless face, staring up at her in the mortuary came back into her mind. More hot tears nettled her eyes at the memory. “Oh Bernard!” she sobbed, "I need you!" So what emotions are you feeling ? I read a very good post by an editor (Sorry I forgot which one), who said never write the words 'feeling' but rather describe the feelings without the initial qualifier (e.g. s/he was feeling or s/he felt), so I took that to heart in my subsequent writing. This blogfest is being hosted by: Cassie Mae and Angela Cothran with prizes! 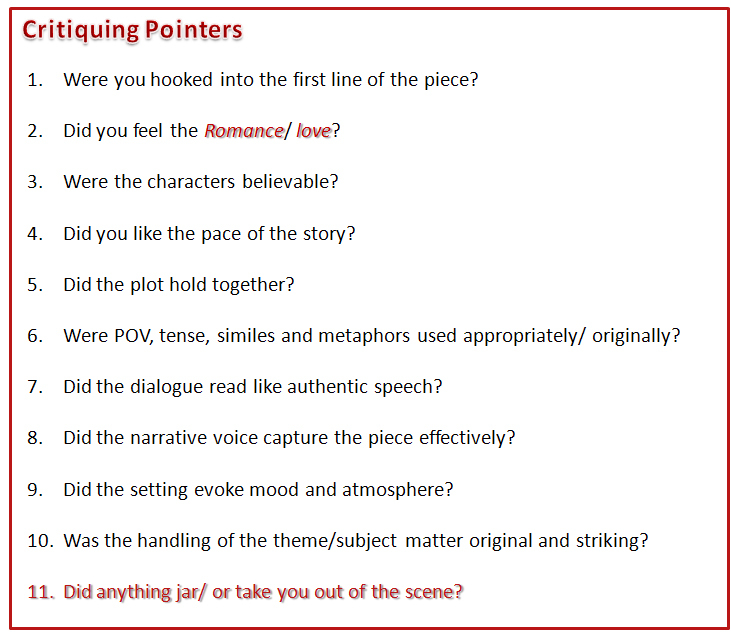 This is a tricky one because producing dialogue without context is pretty much like hearing voices in a white-washed room. However, I've stripped down my piece to the bare bones and eliminated any tags and description, so that you learn everything simply through what is being said and nothing more. This is an imaginary conversation between one of the MC's in my novel and a friend. 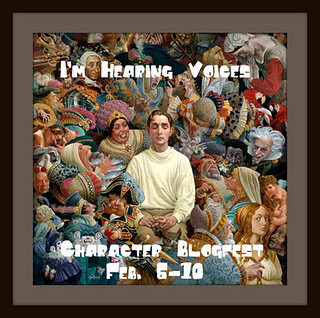 What does it tell you about the characters? Characters on the couch: Have one of your characters answer the following questions (to make this work to your benefit, choose a character who is the hardest for you to write :) Max 250 words (Not including the questions—only the answers). This is a conversation between my MC, Ginny Hart, and her best friend, Gussie (aka Augusta Fairbank, whose chapters I decided to delete from the MS because I had too many POVs in the story. I was also aware that with both character's names beginning with a G this might also confuse the reader). So Ginny, what is your biggest vulnerability? A large glass of wine is my biggest weakness. Okay I'm seriously stalling here. I adore my husband, Bernard. I couldn’t be without him. Will that do? My life at the moment is just how I want it. Most likely that I cannot manage on my own. That I need my husband to look after me. I could manage, I just wouldn’t want to and let’s face it, he needs me just as much. What would I, Gussie, as your best friend say is your fatal flaw? Why? That I’m not maternal. I’m really not overly fond of the idea of being a mum. I’d hate all that pain and bloating. I dread to imagine the horrors of childbirth. And nappies, Yeuch! Oh, I know Bernard adores children and I pretend to be trying for a child, for his sake, but I’m still secretly popping contraceptives every day to ensure that it doesn’t happen. Why would I give up this life, my life for something that squawked, puked and pooped all day and night? I figure what Bernard doesn’t know won’t hurt him. What would I, your best friend, say is your redeeming quality? That I know what I want and go out of my way to get it. I’m resourceful like Becky Sharpe in Vanity Fair and you admire that Gussie, because let’s face it you’re just too nice. Perhaps I shouldn’t be telling you this, but if you were less meek and accommodating with everybody you’d always get what you wanted, too. What do you want most and what would you do to get it? Life to remain exactly as it is. I would do anything to keep it that way, if I've not done it already. So what does that tell you about my MC? 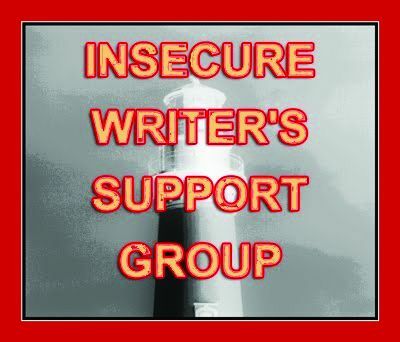 but this week it's been more peanut capacity, which affects my writing creativity. I've been told it's my hormones and that I should challenge my brain with things other than just my normal creative writing. I'm wondering about those Nintendo Brain Games. How do you keep your mind active and challenged? 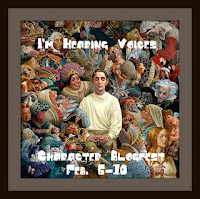 My thanks to Alex J Cavanaugh for hosting this monthly blog hop. 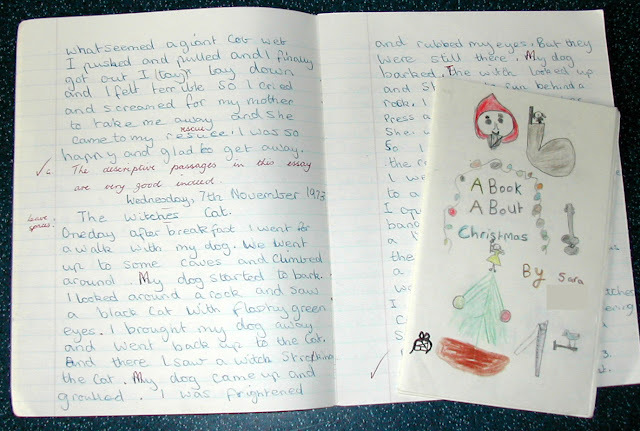 I've read lots of how to books on writing (See Bookshelf blog tab) nevertheless I've found that the comments, feedback, experience and challenge of writing blogfest pieces have taught me so much in such a short space of time. 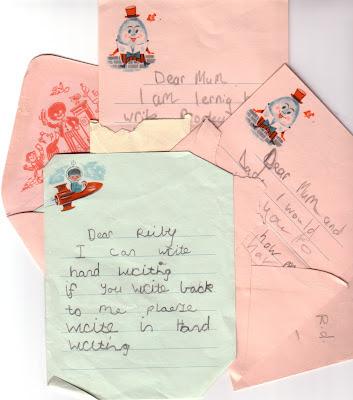 Practicing my writing plus the advice of others has been invaluable through their own blogposts too with trials and tribulations, methods and vices. I think we can read all the help books in the world, but practice and experience brings them to life. I confess that I only began to really learn what it all meant when I began blogging and entering challenges. Okay on to my goals set in previous IWSG post. 2. 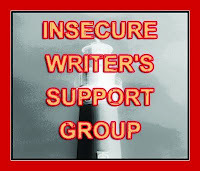 To search for short story competitions and enter them. Yes I've submitted some work! 4. Focus on getting better by reading and writing more. I went to a writing workshop on Thursday, though as I slept badly and had to travel for 2.5 hrs I didn't perform/interact as well as I'd've liked. Also the group didn't stay behind afterwards to chat and share, which was disappointing. People broke off and exited in small groups and pairings instead. 5.Don't obsess over each entry sent. Forget about them once they've been submitted. I'm better than I have been about this. 6. 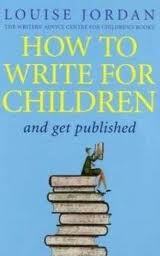 Develop some writing determination. I'm working on this too. 7. Focus on my stories and plots to blot out other temptation/distractions such as blogging. Hmmm, life has a habit of re-routing my best writing intentions with health probs and everyday dramas! 8. Enjoy the process rather than stress about the outcome. Again, I'm working on this one.